Prepare mini pancakes according to package instructions. Set up a pancake bar, with the mini pancakes, fresh fruit, yogurt and maple syrup for drizzling. Spoon a teaspoon or so of yogurt onto the mini pancakes, then top with fresh fruit and drizzle with maple syrup. Oh my goodness – can you believe it? Summer has finally arrived! And with summer has come the rainbow of delicious fresh fruit that’s now in season. Those beautiful colors have a way of making my day, and I somehow always return home from the market with more fruit than I (ahem) was planning to buy. But beautiful fruit is meant to be celebrated, especially at breakfast! 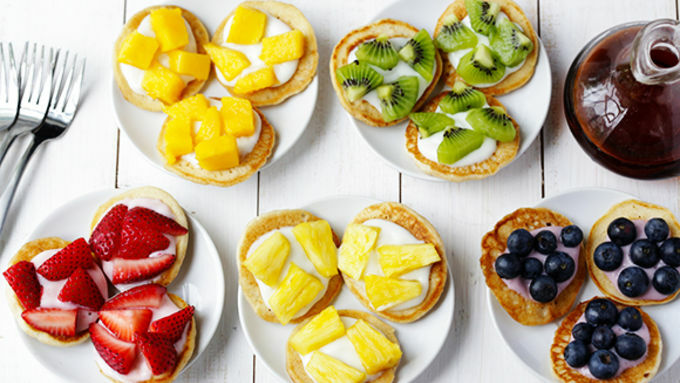 So for a fun brunch idea this summer, why not have a Mini Rainbow Pancake Brunch? It is so simple! 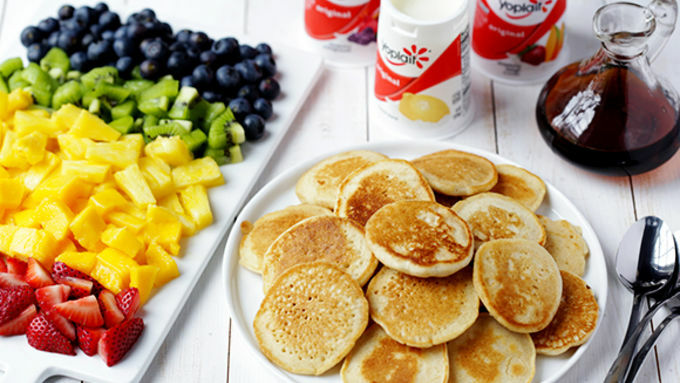 Just make a batch of mini pancakes, top them with some yogurt and chopped fruit, and then drizzle with maple syrup. So easy, so tasty, and your friends and family will have a great time mixing and matching their own colorful creations. I used fresh strawberries, mangoes, pineapple, kiwi and blueberries. 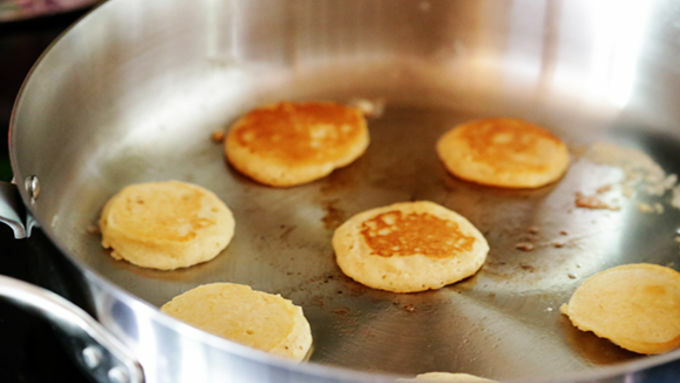 Be sure to cut them into a pretty small dice so that they will fit easily on the mini pancakes. 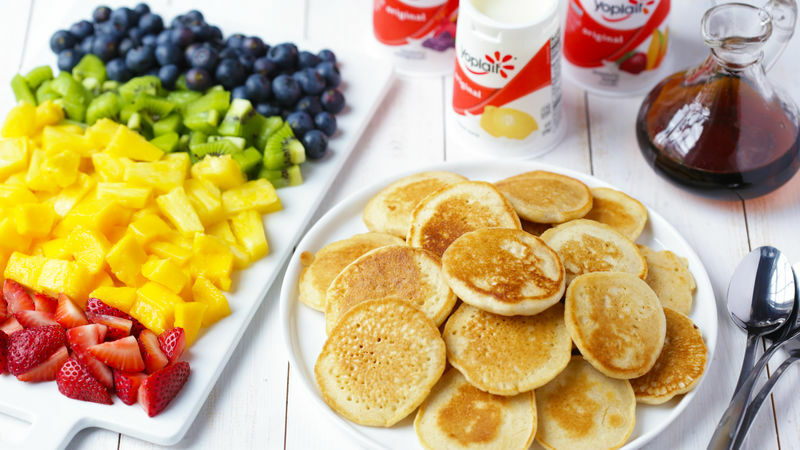 Then set out your pancake brunch bar with all of the delicious ingredients – the cooked mini pancakes, rainbow of chopped fruit, your favorite Yoplait yogurts (I went with the honey and fruity kinds), and some maple syrup. Then mix and match your favorite combinations to taste the rainbow! Look at all of those gorgeous colors. Almost too pretty to eat. Don’t forget to drizzle some maple syrup on each one to complete the pancake magic.